Pastor Daniel talks about evangelism with his dad, Pastor Joe Williams from Calvary Chapel in Tacoma, Washington. 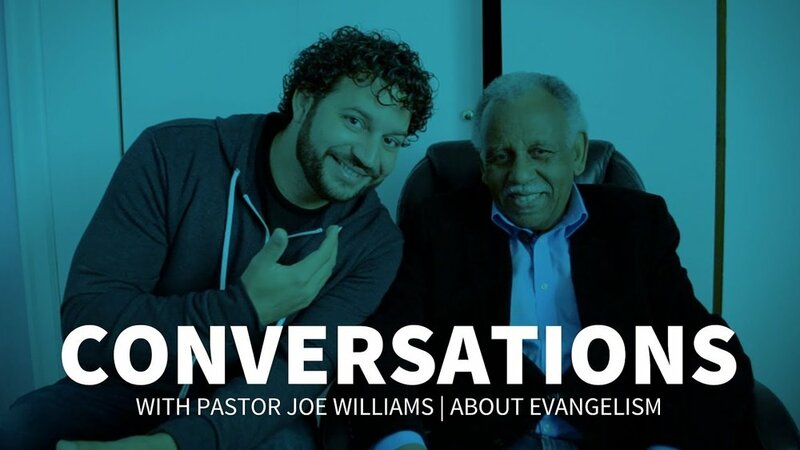 Evangelism isn’t just something that pastors do; every Christian is called to evangelize. But what is it? And what are we supposed to do? “If you’re a Christian, you have something to say,” says Pastor Joe. “You have a testimony. Tell people what Christ has done for you. Wherever you are, you are representing Christ. People need to know what you know!” Someone told you the good news about Jesus. Now it’s your turn to tell someone else. Don’t assume that people know what the Bible says. Many people have never heard what the Bible says or read a verse. “People may not read the Bible, but they read us. The Bible does not tell them to come to us, it tells us to go to them.” The gospel is the power of God for salvation, we are told in Romans 1:16. It is the power of God at work when we share the gospel. Don’t be intimidated. Use your own personality. God will work through you. There are many ways of doing it. Just keep at it. What did Jesus do? “Jesus went where the people were. He went to the Samaritan woman at the well. (John 4) Go for the one. Win people to Christ one at a time.” These are great words of encouragement and wisdom from a man who has made it his life’s mission to share the gospel with one person every day. “Ask God to give you compassion for the lost. Look for opportunities. Pray for boldness.” Amen to that.